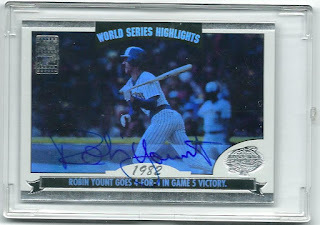 I've been told that some of these Sports Card Tour posts are very long. Don't worry, this stop will be a brief one. Today we're in Jacksonville. 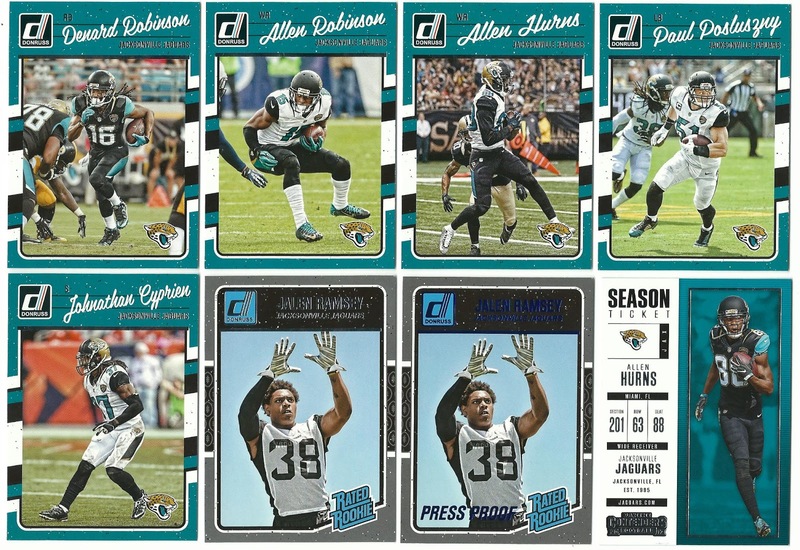 Jacksonville is home to the AFC South champion Jaguars. 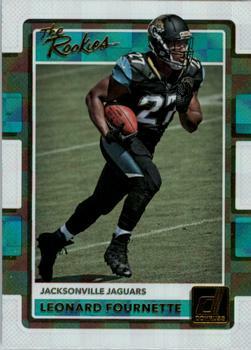 The Jags made their third appearance in the AFC title game last season, losing a 24-20 heart-breaker to the Patriots. 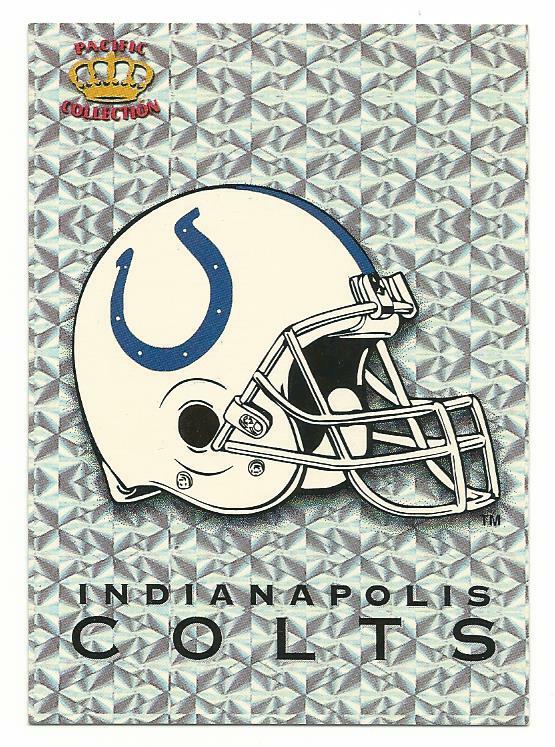 They have not advanced to the Super Bowl in their 23-year history. 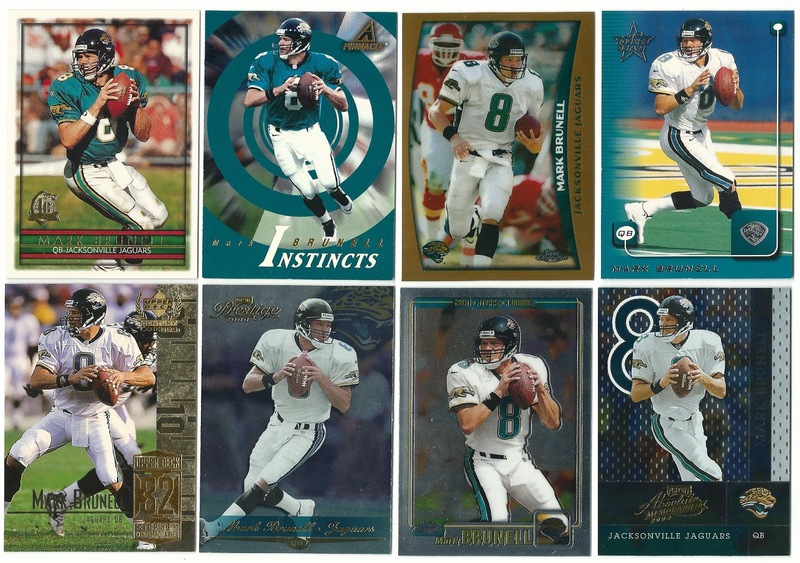 Mark Brunell led Jacksonville to their first two appearances in the AFC Championship game. 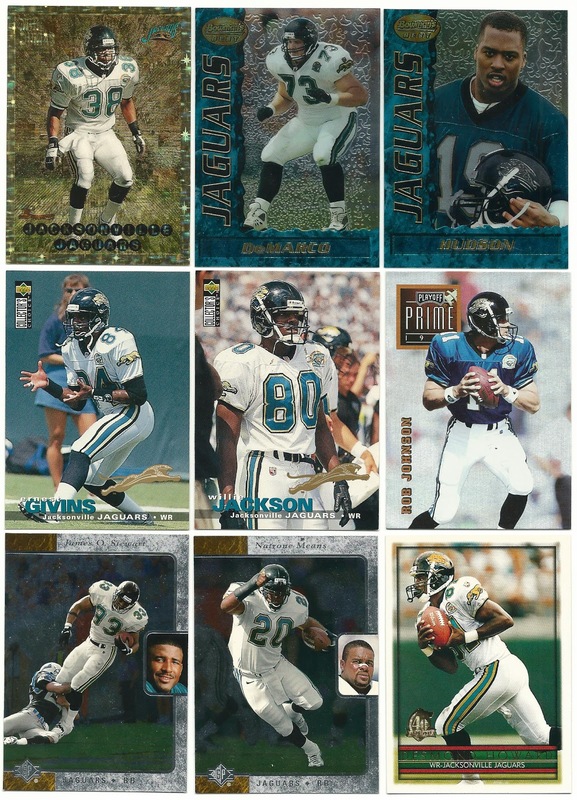 I have ten Brunell cards in my Jags binder pages (plus a few more in my Packers collection), and at one point I had a replica Brunell jersey in my closet. 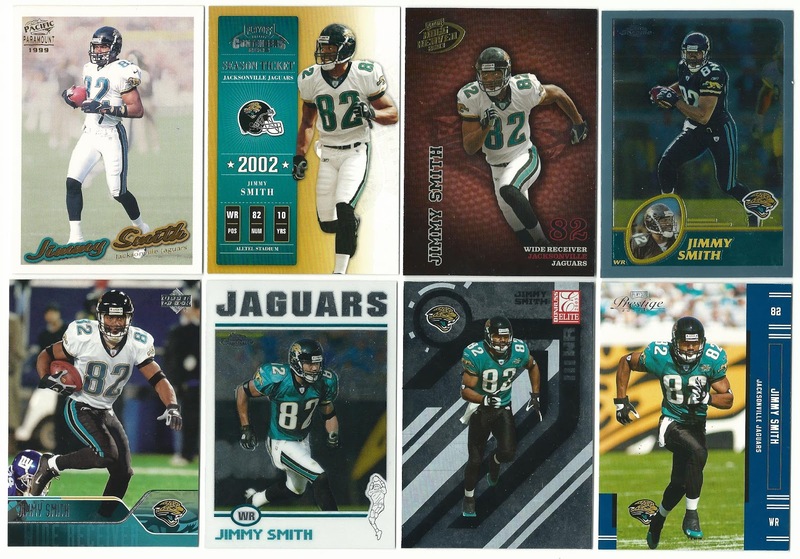 Jimmy Smith was Brunell's top target, and the Jags' all-time leading receiver. 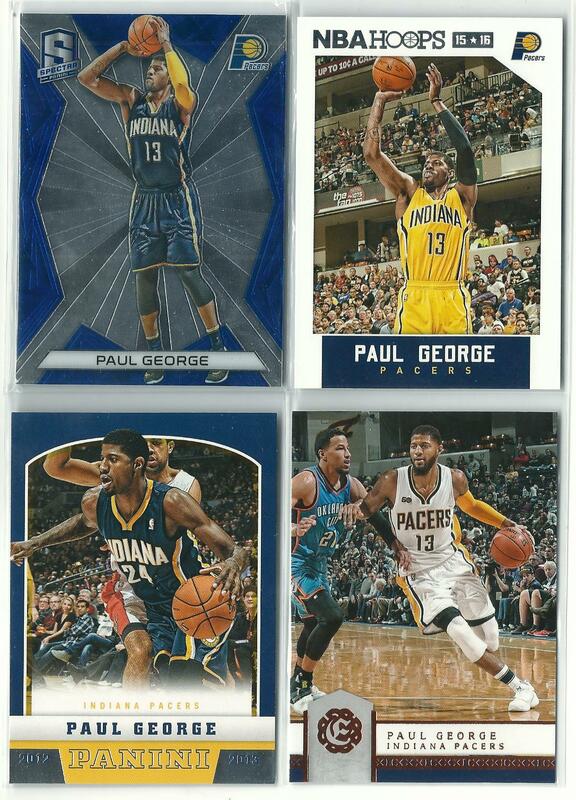 The Pacific card at the top left might be a gold parallel, but I keep it in the base card binder. 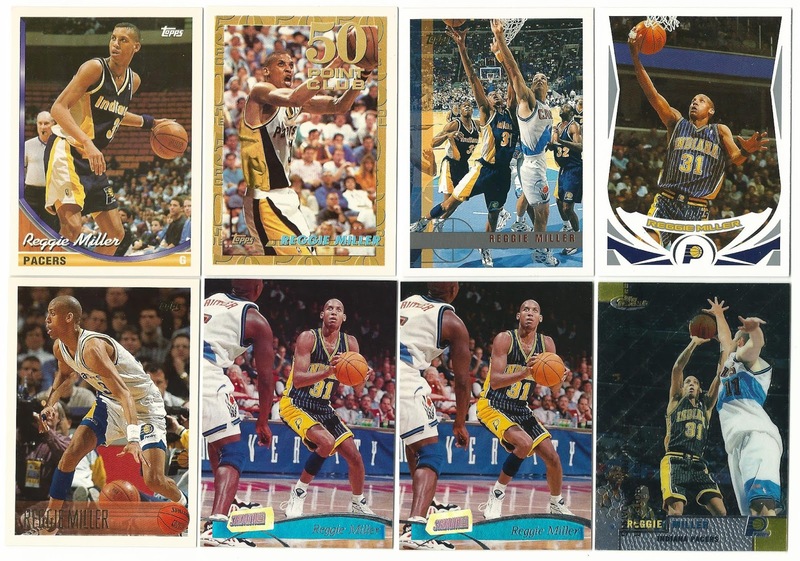 Same with the Mike Dumas above. 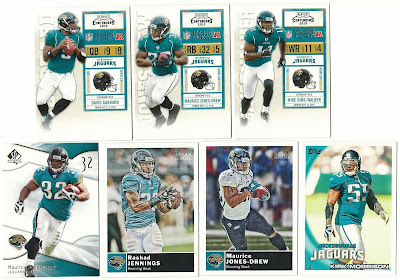 The jumping Jaguar on the Collector's Choice cards is kind of cool, I wonder why they didn't use that as their logo? Too Lion-like I guess. 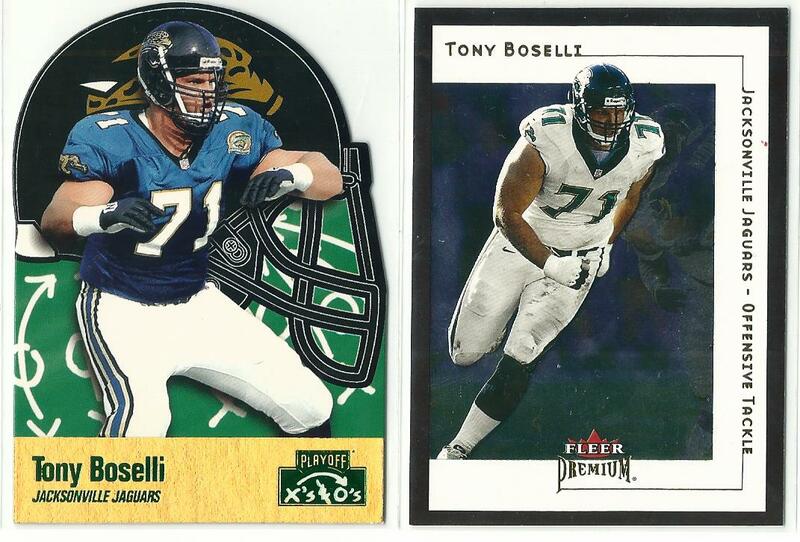 Tony Boselli was the Jags' first ever draft pick. 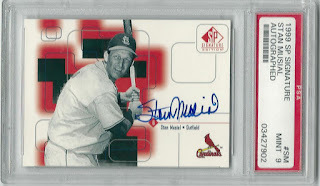 He was named a finalist for Hall of Fame consideration and if he is elected, this Fleer Premium base card will join my four Fred Taylors in the stars/HOFers box. 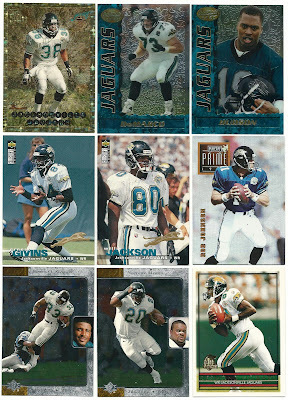 My football card collection was dormant for many years - until I bought a flat rate box filled with cards like these from eBay about 3-4 yrs ago. 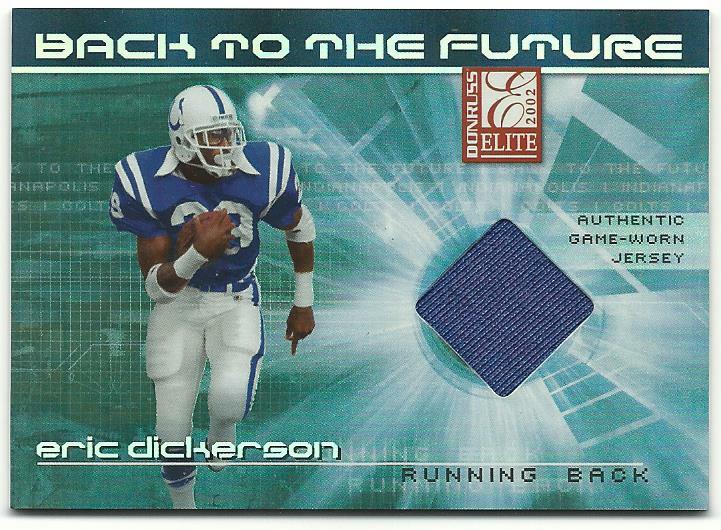 I tried that again earlier this month, but as I mentioned there were very few football cards included. 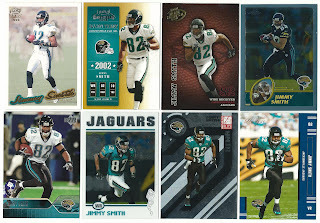 These are the newest Jaguars cards in my collection. 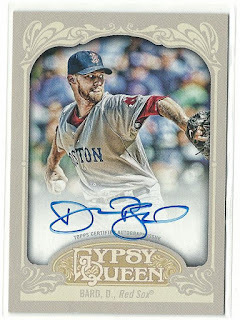 I never liked 1990 Donruss baseball (too bland and too red) but the 2016 version is a nice and colorful nod to that old junk wax set. 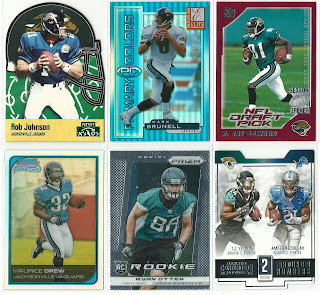 The jumbo box I bought from Dave and Adam's often had the same "rated rookie" in base and Press Proof versions. ...and coincidentally also pitched for the Jacksonville Suns. I'm sure there are NFL players who suited up for Indy and Jacksonville, but none immediately come to mind. 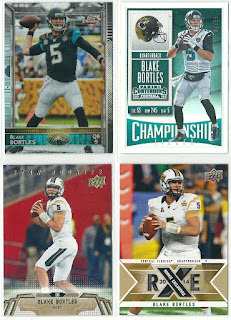 Last but not least... Bortles! If you're a fan of The Good Place, then you're in on the joke. At least it was a joke before Blake Bortles shocked the world by winning football games. 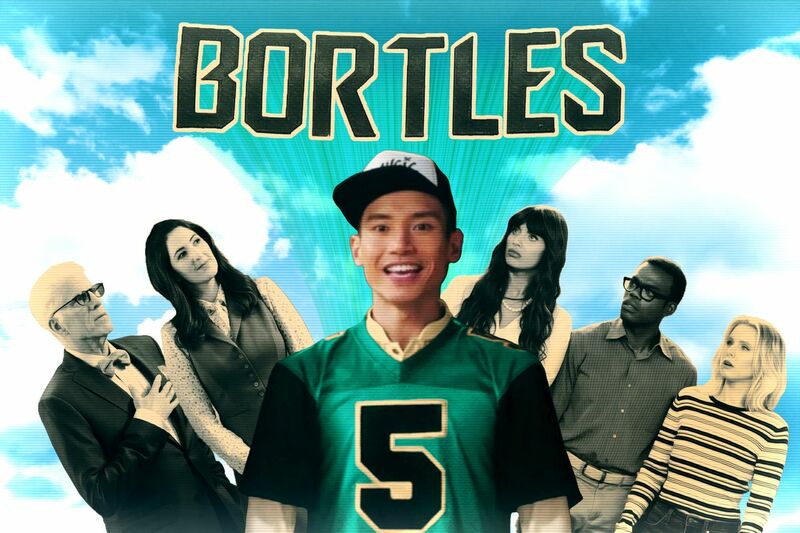 Some female fans of the show did not know Bortles was a real person. 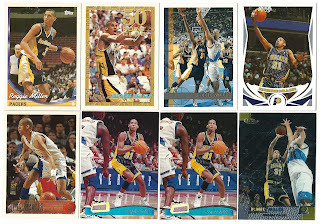 Now he's kind of a cult hero. 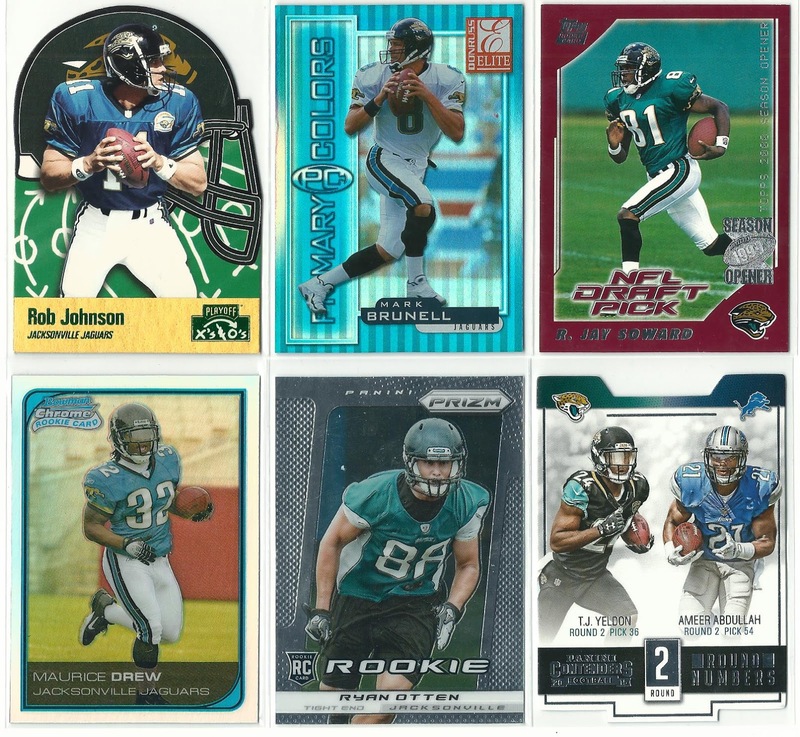 I picked up the top two Bortles cards on COMC for about 50 cents each; the Upper Deck college cards are from a blaster box my brother-in-law gifted me. 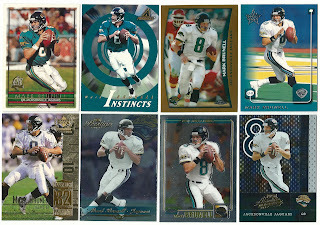 Maybe I should pick up some more - just in case the Jags prove Michael wrong and win the Super Bowl. Jaguars card I'd like to own: A Leonard Fournette rookie card, though I'm very picky about 2017 Panini products.Too many cards come from the same photo shoot/angle. Vrooom vrooom! The Collector's Sports Card Tour bus speeds into the Hoosier state. Today we're in Indianapolis. 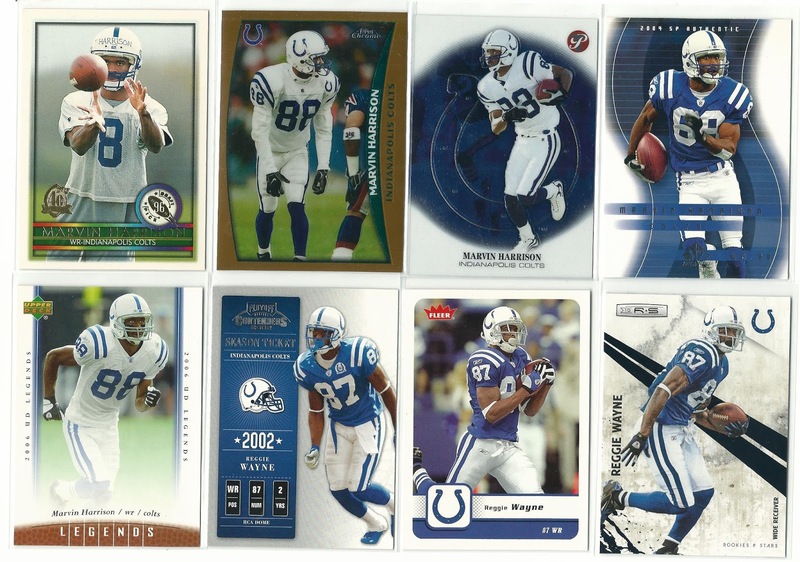 Indianapolis is home to two pro sports teams - the Colts and the Pacers. 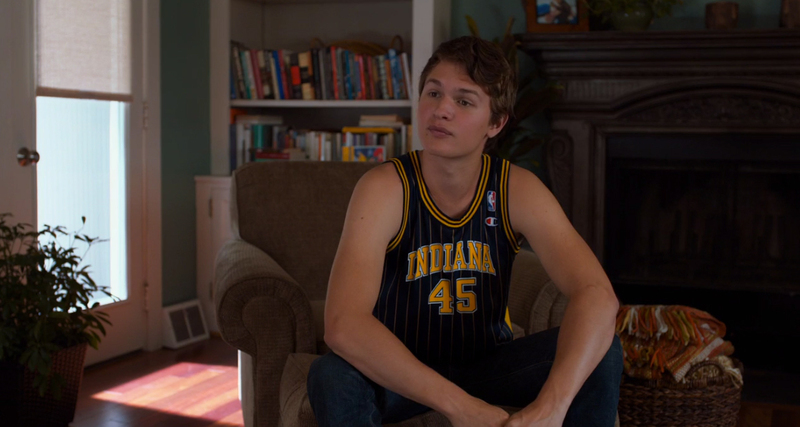 It is also home to my writing idol John Green..
..which (mostly) explains why he name-checks Pacers great Rik Smits in his best-selling book The Fault In Our Stars. 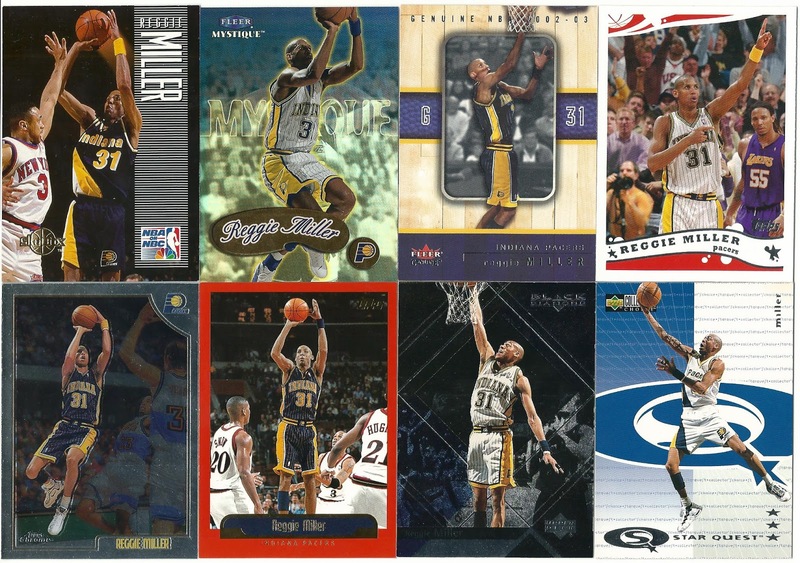 I have a few Rik Smits cards in my binder..and a few Detlef Schrempf cards..
..but my all-time favorite Pacers player is Reggie Miller. 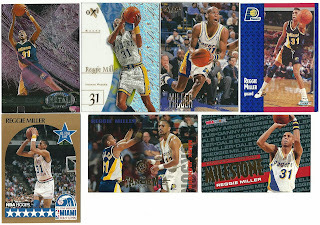 I think I have over 40 Miller cards now, which has to be the most I have of any one NBA player. 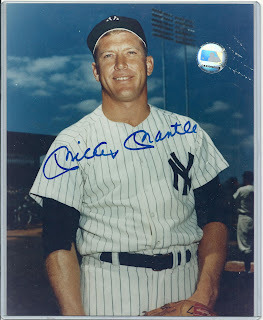 Thanks again, Dennis! The only other Pacer in my star player box is Paul George, or "Playoff P" as he calls himself. 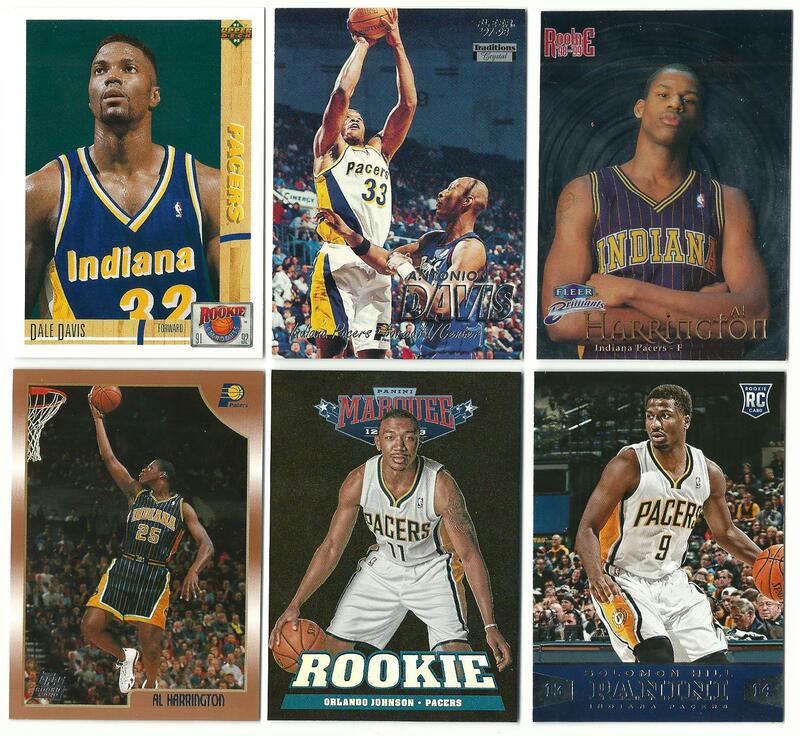 Myles Turner might be the only current Pacer in my collection. 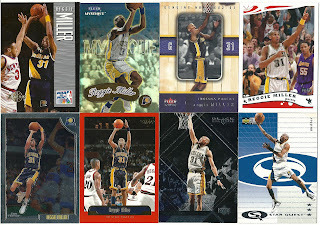 The Antonio Davis crystal parallel was one of a baker's dozen in the eBay box. 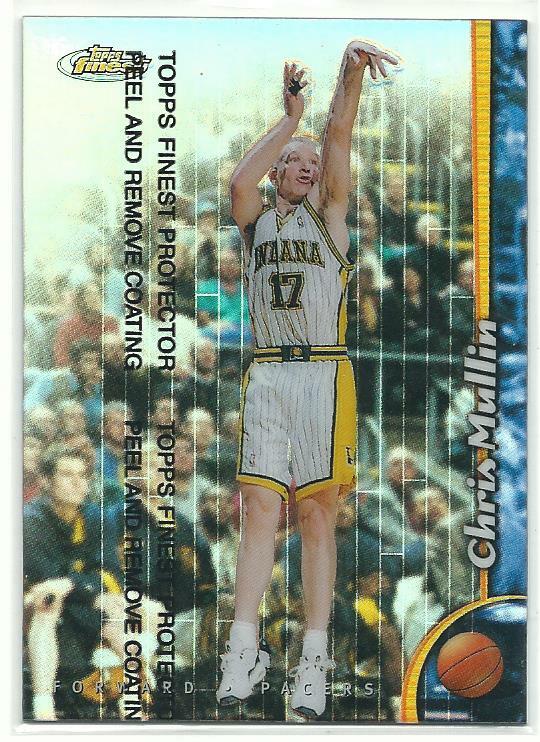 I bought this Chris Mullin refractor for just over $1 on COMC. Mama! There goes that man. 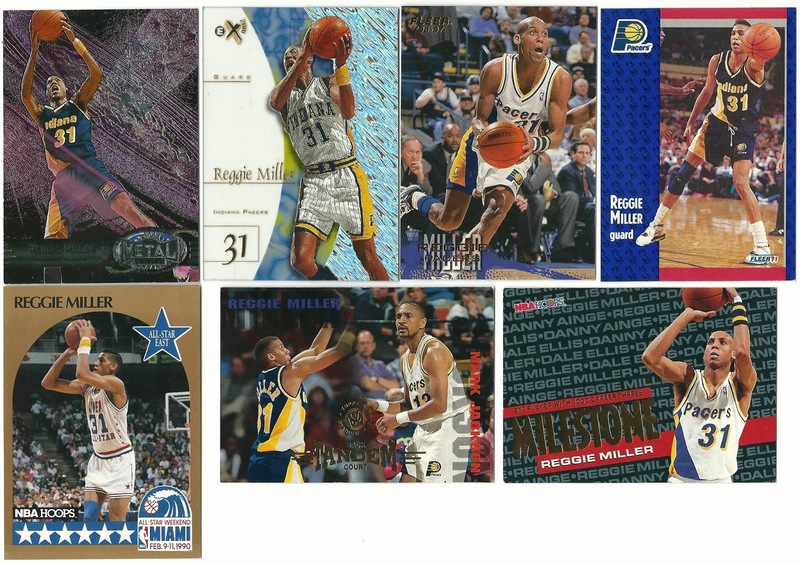 Mark Jackson, Mullin, and Miller were teammates on the 1999-2000 Eastern Conference champion Pacers - the only finalists in the franchise's NBA history. 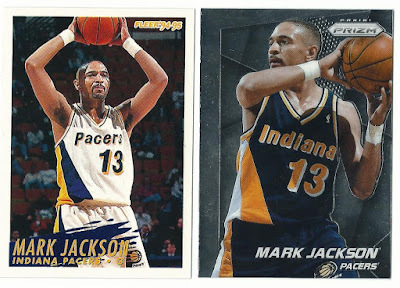 I have no personal ties to Indiana - but a lot of my favorite athletes and entertainers do. 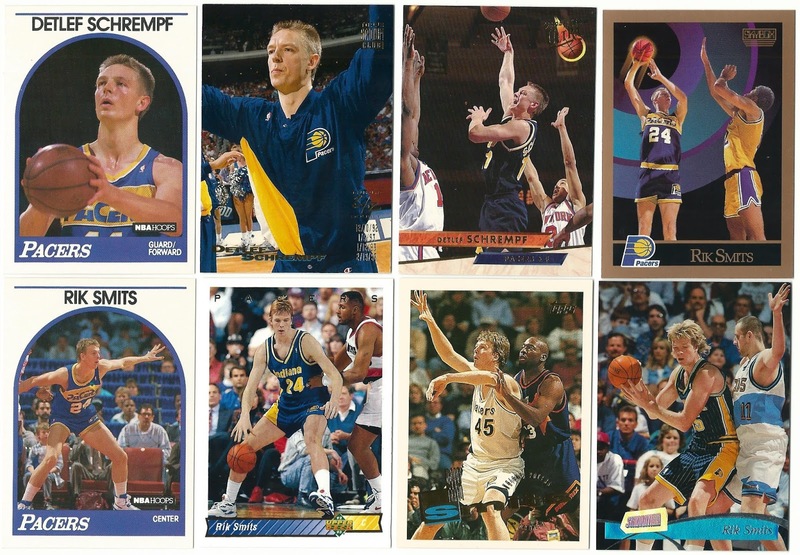 My favorite comedian Jim Gaffigan has Indiana roots. 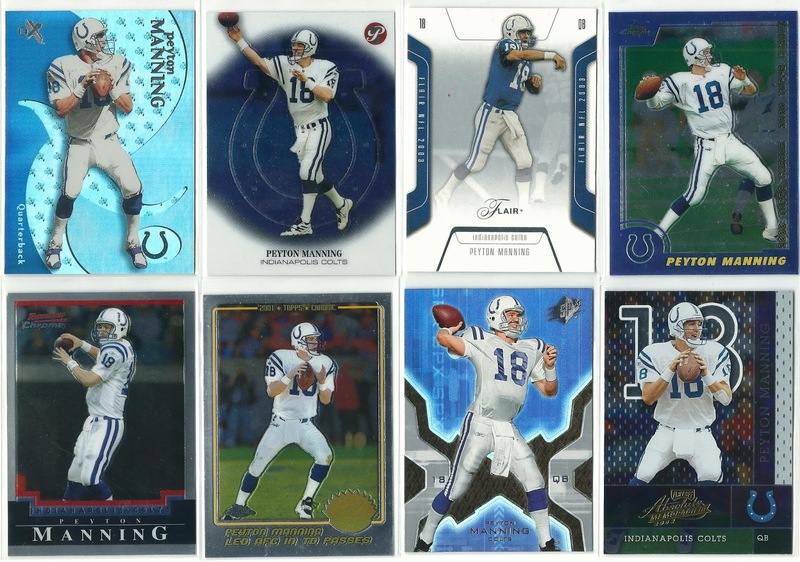 Don Mattingly and Larry Bird (head coach of that 2000 Pacers team) were among my favorite sports stars of the 80's, and one of my all-time favorite football stars is Colts legend Peyton Manning. 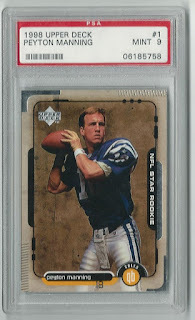 Manning was a maestro on the field, and he's been just as much fun to watch off the field, appearing in at least a dozen commercials, guest-hosting Saturday Night Live, roasting Ann Coulter Rob Lowe and hosting the ESPYs. For a while it seemed like Manning and the Colts would never get past their arch-rival Patriots and win the big one - but the five-time NFL MVP led Indy* to its only Super Bowl victory in 2006. I was thrilled for "The Sheriff" - especially since he beat Tom Brady and my team's arch-rival, the Bears. 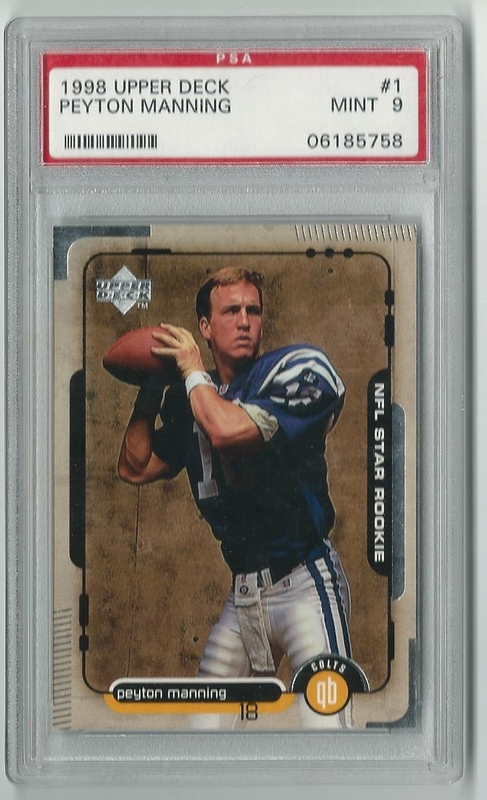 This is likely my only Manning RC; I had two copies of his 1998 Finest RC (one was part of a complete set) but I think those are gone, too. 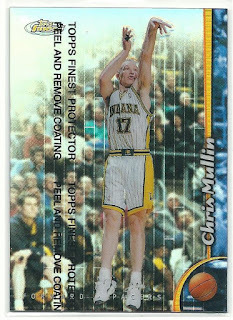 90's Finest/Chrome cards do not hold up well. 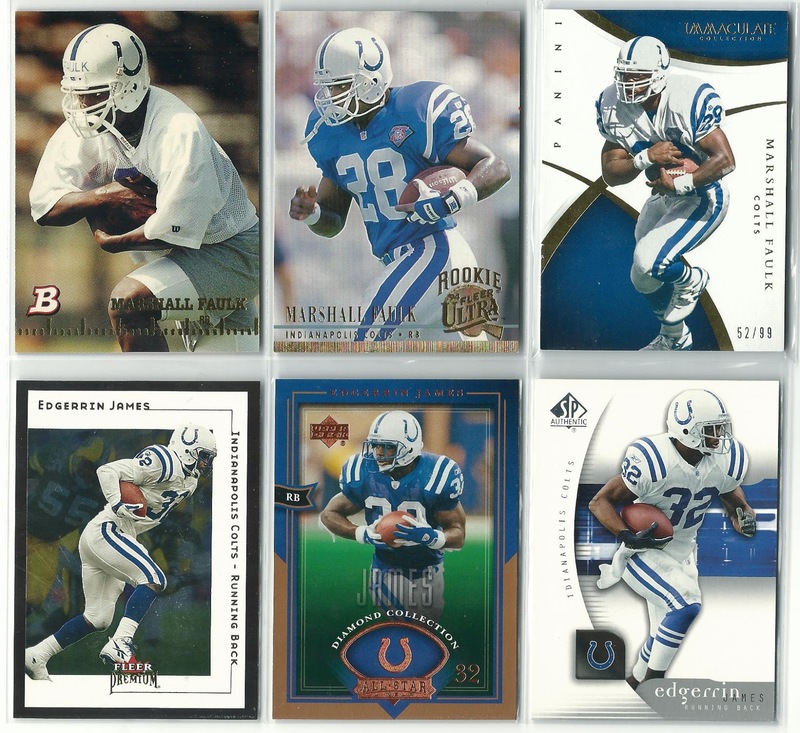 The Colts' line of succession rivals only the Favre-Rodgers era in Green Bay. 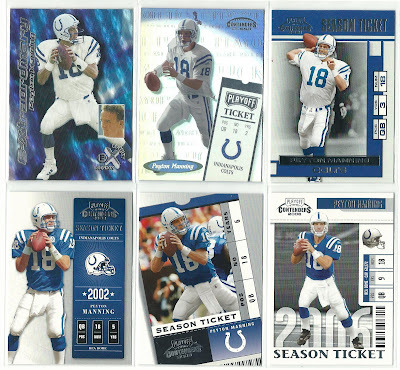 Manning led the Colts to ten or more wins in 10 of his first 11 seasons, then missed the entire 2011 season with a neck injury. 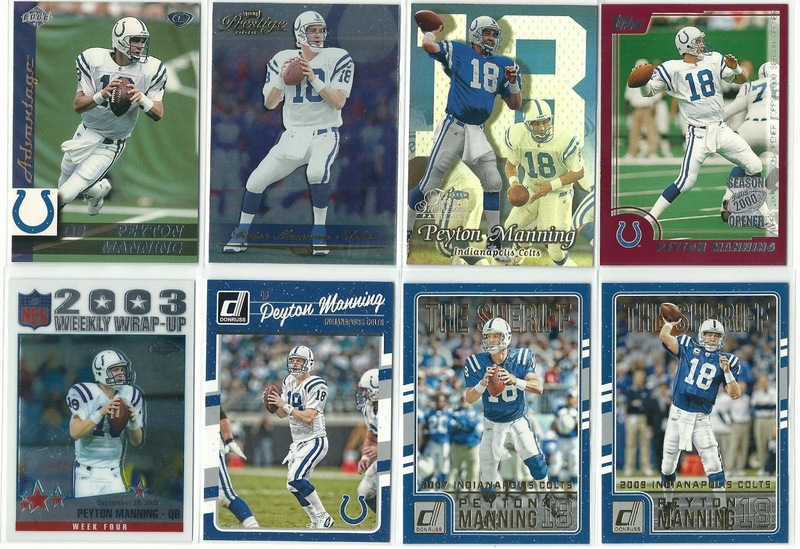 After the Peyton-less Colts finished the season 2-14 they drafted Andrew Luck first overall. For a guy with horseshoes on his helmet and "Luck" on his back, Andrew has already had more injury misfortune than Manning. 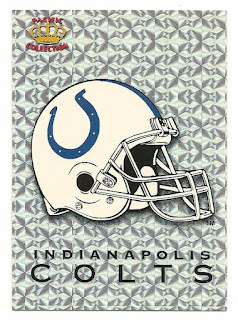 Luck missed the entire 2017 season with a shoulder injury, and Indianapolis finished 4-12 without him. 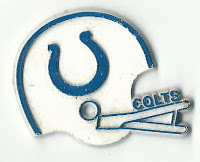 The Colts traded down with the Jets and will pick 6th overall in tomorrow's NFL Draft. 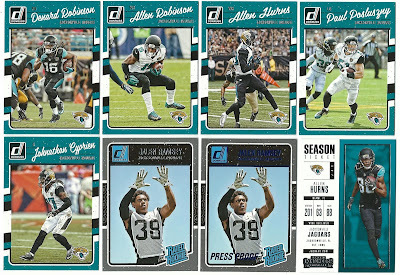 Because I've stopped buying new football products, I don't have any Luck base cards. The Colts cards in my star player box are all retired players. 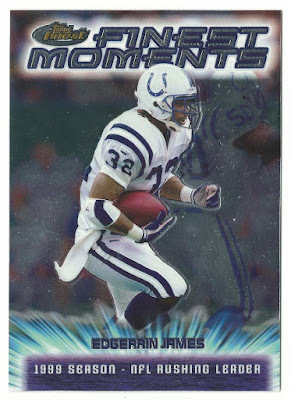 Have I mentioned how much I love 2002 Topps Pristine? I really need to replace my irregular-sized binder pages before I wreck all my irregular-sized cards like this box topper. 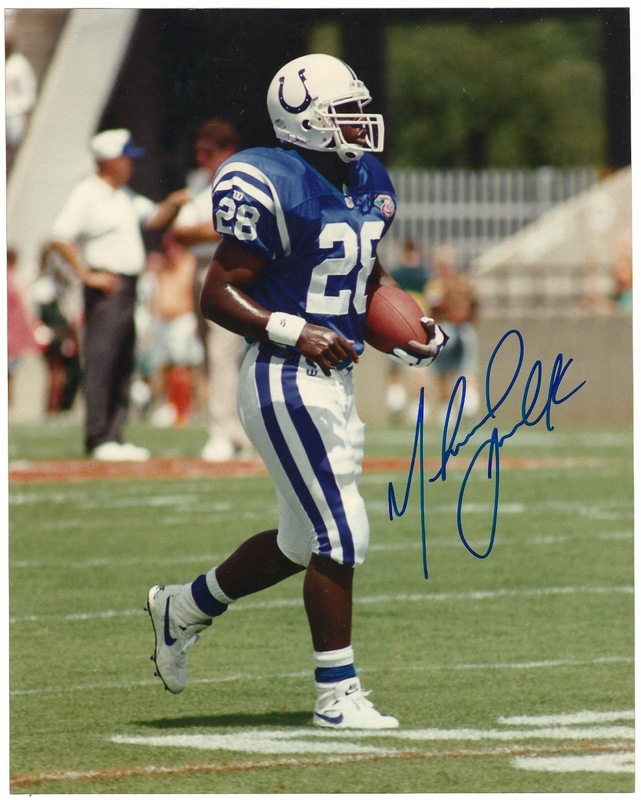 In my Green Bay post I mentioned that I bought a few autographed 8 x 10s at a memorabilia store in my local mall. This Marshall Faulk auto was in the group; the first one I picked out was smudged and I marched back into the store and switched it out. My other PSA-graded Colts RC. 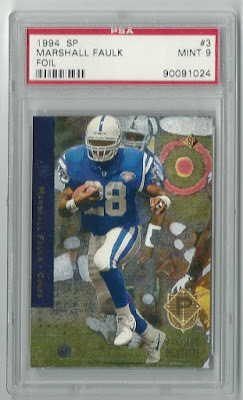 Marshall Faulk was the best all-around back of my generation; I'm surprised that this card was only $10. Like Faulk, Eric Dickerson also ran for the Colts and Rams. This is the only Colts relic in my collection; it's numbered to 75. 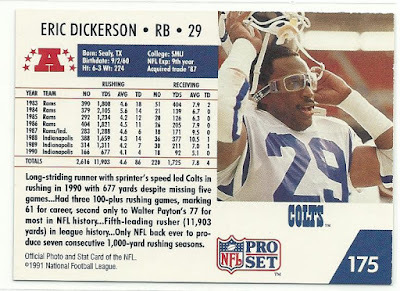 I've got a small Dickerson PC, including an unopened Starting Lineup figure from 1988 and his 1984 Topps RC, which you'll see in my Los Angeles post. 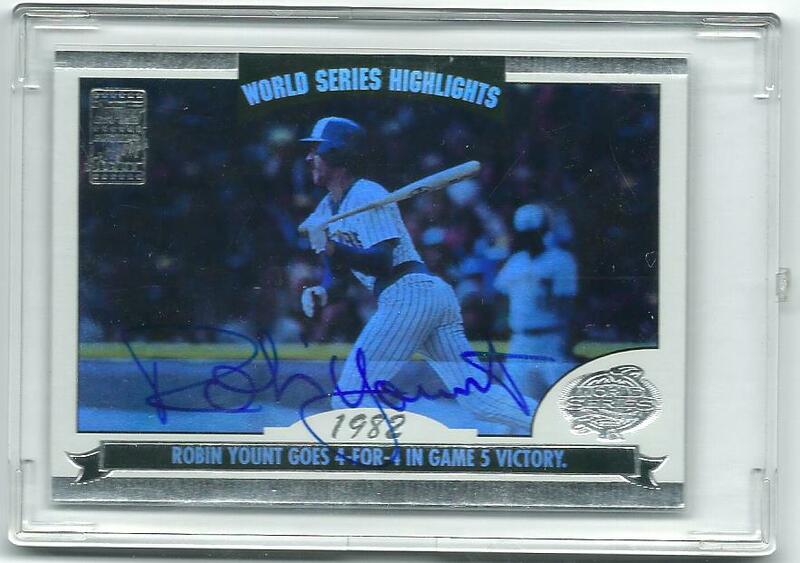 The latest addition is this "1987" Donruss card, which cost me a mere 45 cents on COMC. 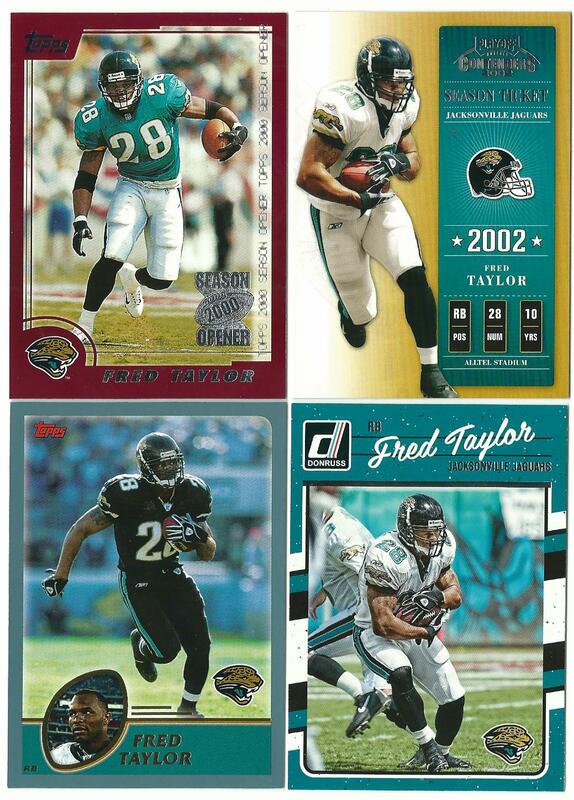 The NFLPA logo is missing at the bottom because Pro Set. 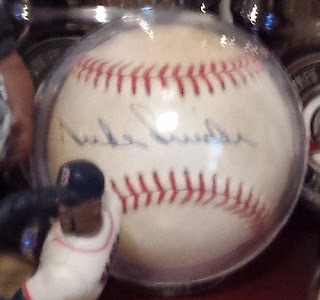 All of the items you've seen in this post are in my possession - until now. I wanted to acknowledge the fact that hockey legends Wayne Gretzky and Mark Messier started their pro hockey careers with the WHA's Indianapolis Racers before the team folded in 1978. There are a couple mainstream Gretzky issues that picture him with a Racers jersey, but I don't have them in my collection. 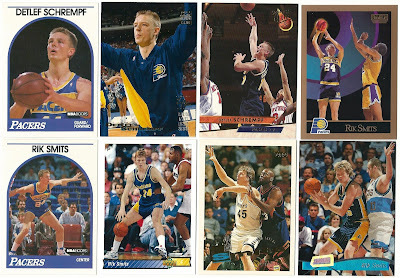 And if I'm going to show you cards I don't have, why would I choose a black-and-white card from 1990-91 Topps? 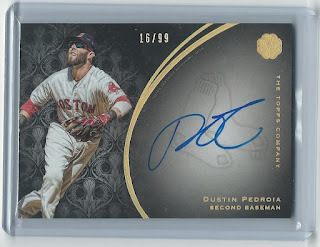 This aftermarket oddball looks like it belongs in a repack - but it has actually been the subject of confusion, as some sellers have tried to pass it off as a legit pre-rookie card. 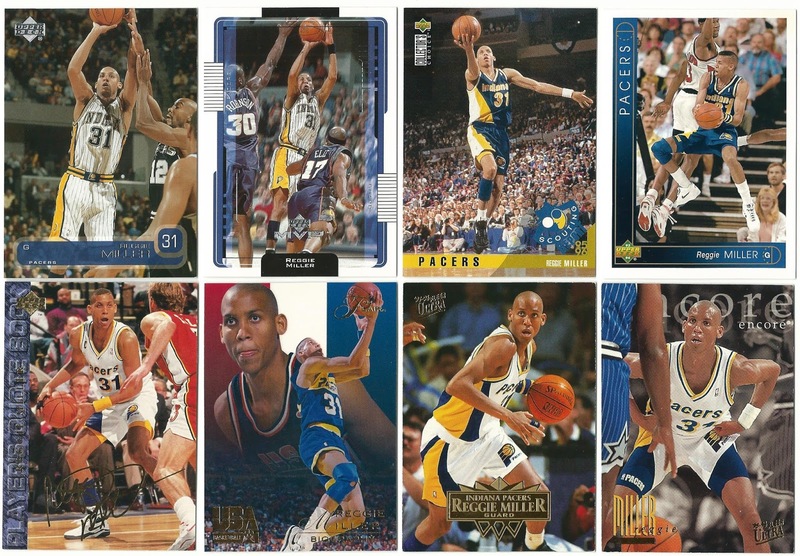 Pacers card I'd like to own: Eventually I'd like to complete the 1988-89 Fleer set, and the Reggie Miller RC is one card I still need. 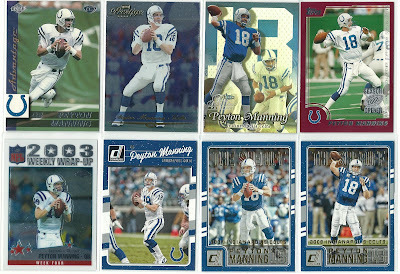 Favorite Colts player: Andrew Luck... but holy crap Adam Vinatieri is still kicking? Wow. 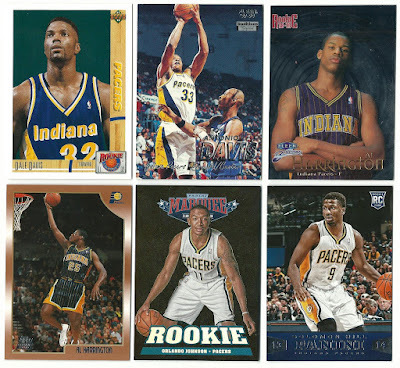 Favorite Pacers player: TBD. Let's see how this series with the Cavs shakes out. 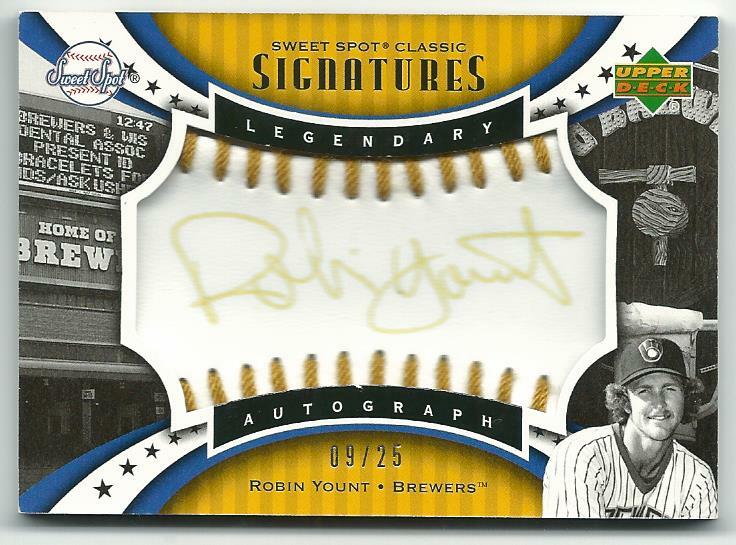 You may have already seen some of these on my Sports Card Tour, where I discuss some of my favorite cards, players, and teams in a city-by-city review (my Houston post is here) I will likely repeat some items you see in today's post, but I couldn't pass up this great idea. Like some other bloggers, I won't exactly be following ZZ's guidelines. This is a matter of necessity, not an act of defiance. I really tried to build a bullpen, honest. 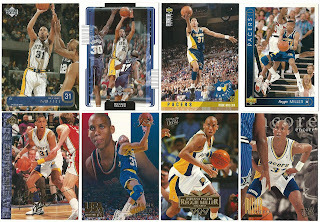 But I'm lucky I have one guy that can maybe close out games. And my catching situation is ..well, you'll see. Behold! 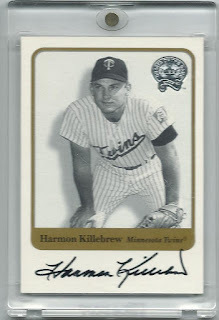 The best lineup I could make out of autographed cards in my collection. Leading off...the Left Fielder. Number six. Stan Musial. 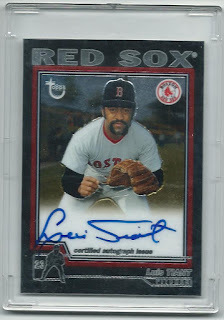 Bought this on eBay a year or two before he passed. 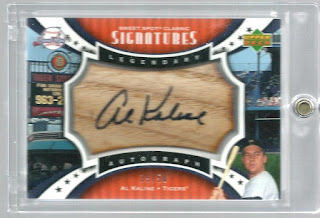 Batting second...the Right Fielder. Number six. Al Kaline. 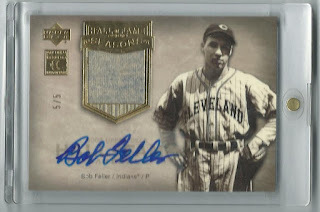 Pulled this out of a tin I bought from Dave and Adam's. 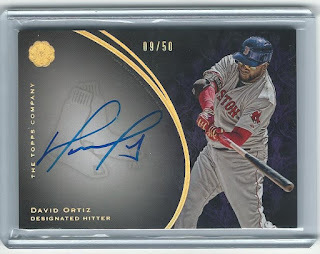 Batting third...the Designated Hitter. Number thirty-four. David Ortiz. 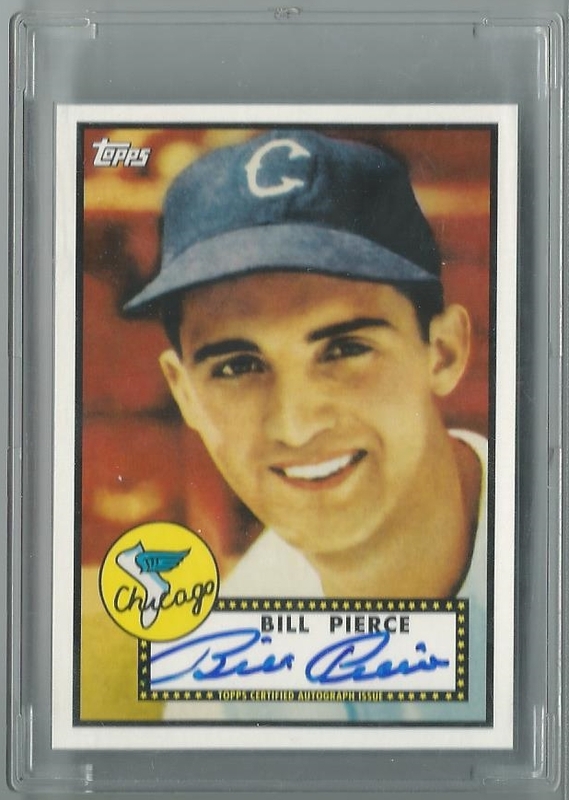 Snatched this up on COMC during a Black Friday sale. Batting cleanup...the Center Fielder. Number seven. Mickey Mantle. My mom gave this to me a few years ago. I don't remember how or where she got it, but she had it in her closet since at least the early 90's. 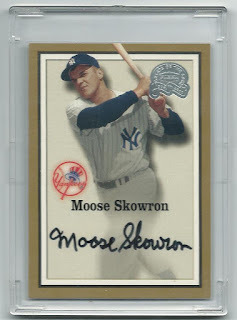 Batting fifth...the First Baseman. Number three. Harmon Killebrew. Bought this for $30 sometime around 2003-04 at a card shop in the mall. Batting sixth...the Third Baseman. Number seventeen. 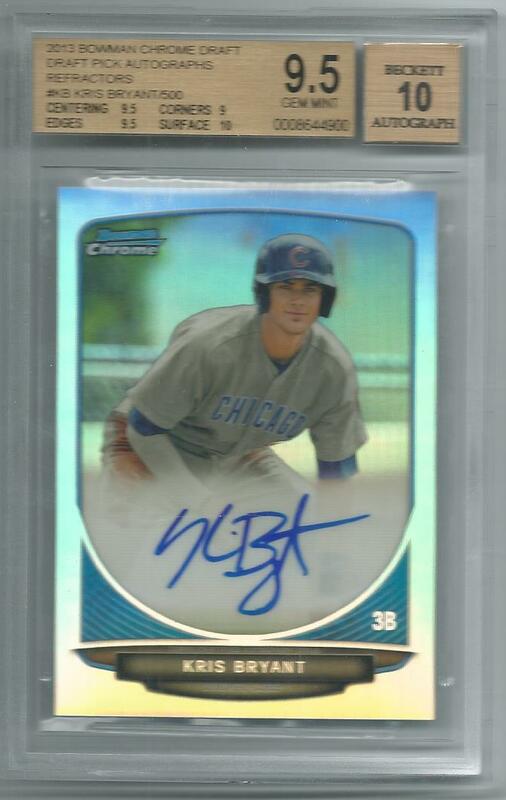 Kris Bryant. Bought ungraded for about $200 in December 2014. 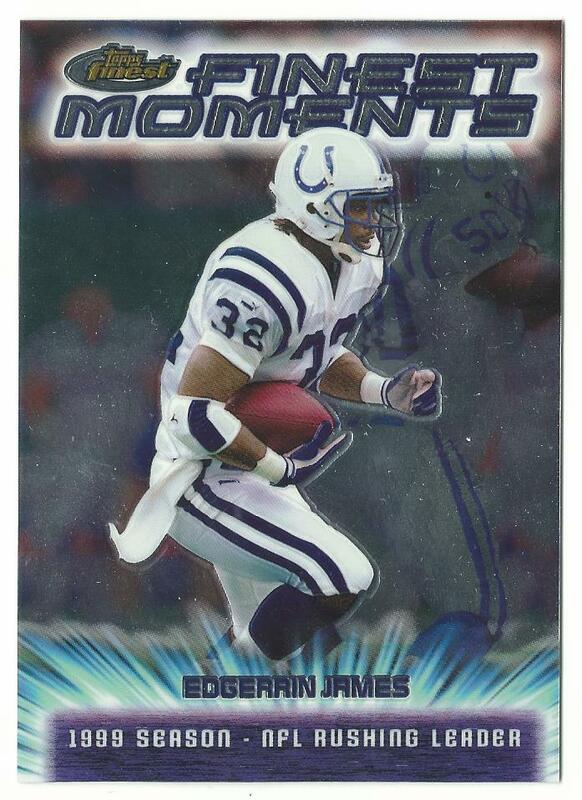 Submitted to BGS via COMC. Batting seventh...the Second Baseman. 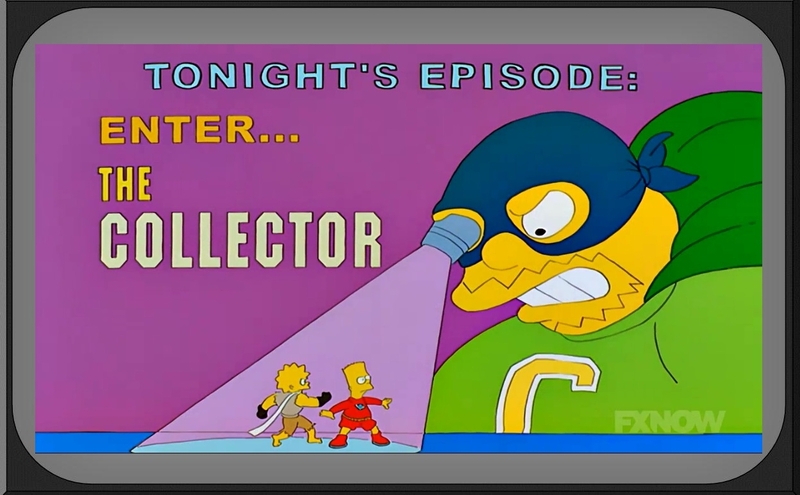 Number fifteen. Dustin Pedroia. 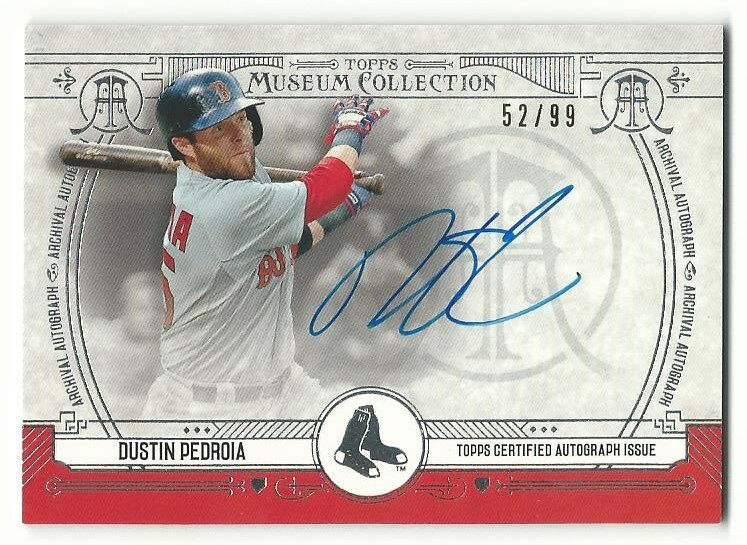 I have five Pedroia autos in my collection. These two were acquired on COMC. 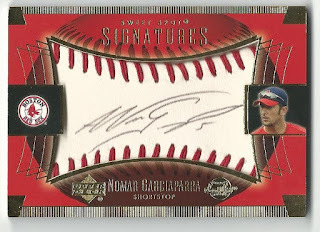 Batting eighth...the Shortstop. Number nineteen. Robin Yount. I also have an 8 x 10 auto which I promise to find before my Milwaukee post. Batting ninth...the Catcher. Number twenty-three. 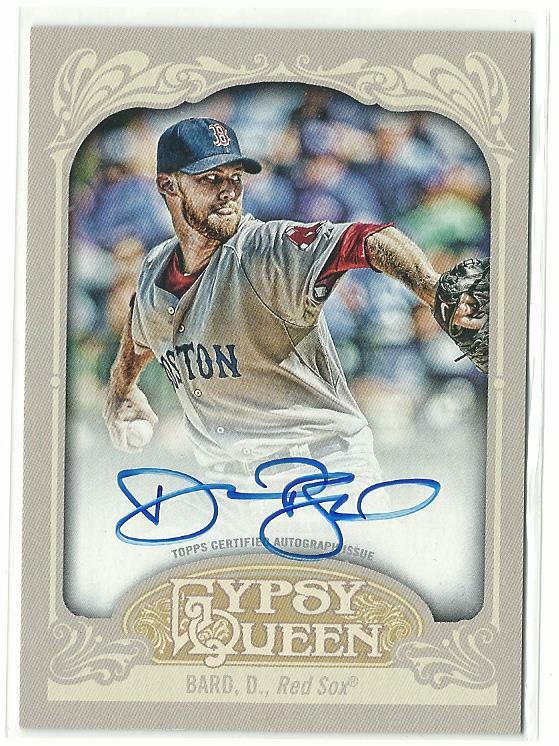 Blake Swihart. Yes, Swihart finally gets to play. No, he does not belong with these legends. On the mound...the Starting Pitcher. Number nineteen. Bob Feller. 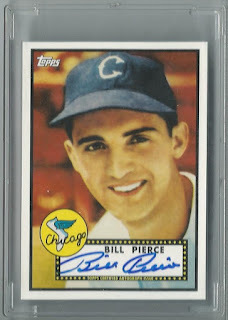 One of my first major purchases on COMC. 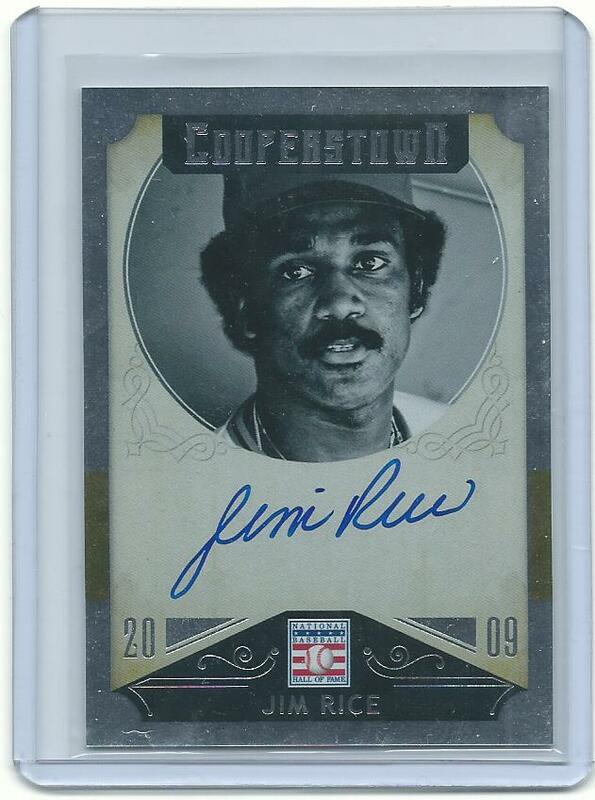 Matt (Bob Walk The Plank) sent me this Jim Rice Cooperstown card. 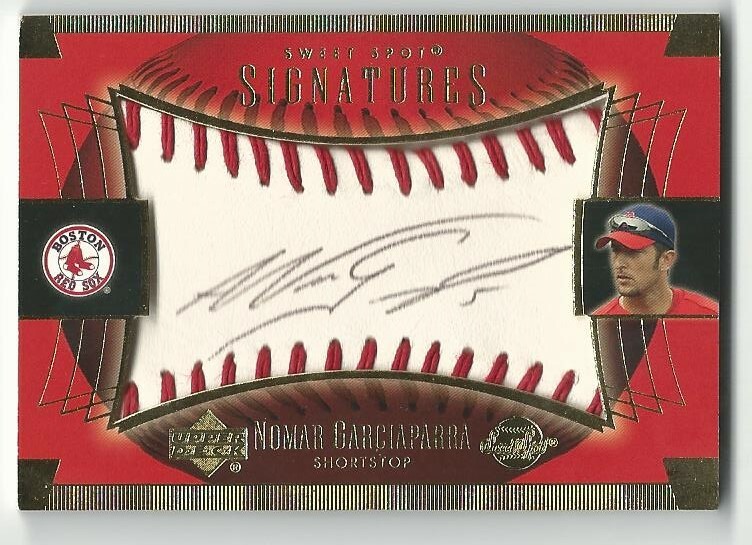 I bought this Nomar Garciaparra on eBay a few years ago. I pulled this Tony Oliva from a tin I purchased at a card show about eight years ago. This Omar Vizquel auto was a $5 impulse buy at a card show I attended last month. Can't recall where I got this Bill "Moose" Skowron auto. eBay maybe? 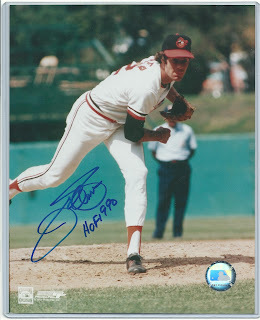 Jim Palmer signed this for me at the East Coast National a few years back. 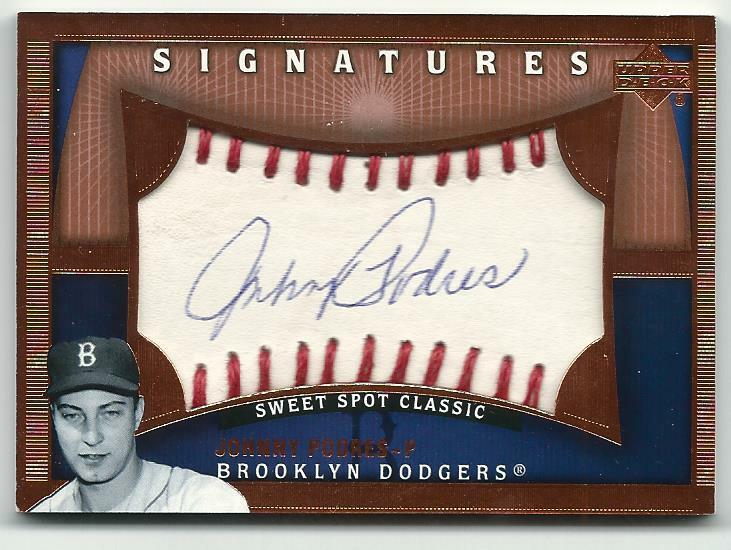 I bought this Johnny Podres auto for $10 at the same show that Palmer signed my photo. 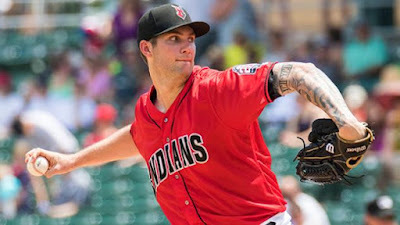 Last but least...my closer. Tremble in fear before the Bard! 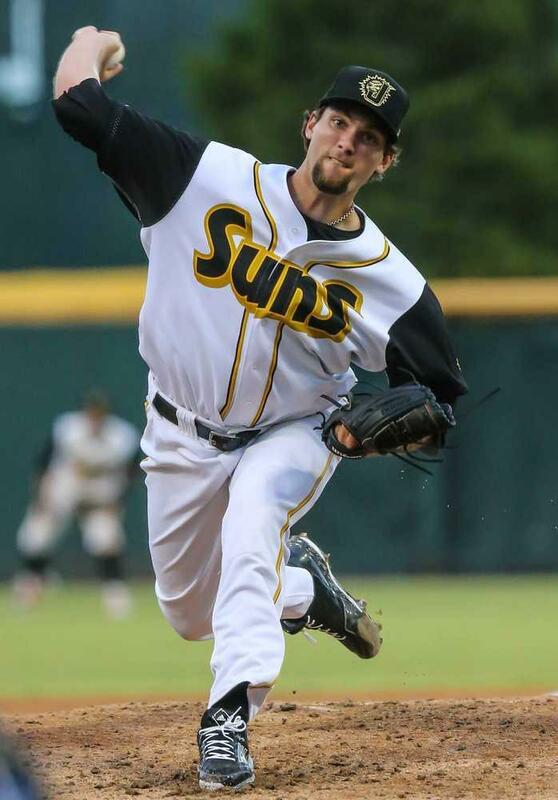 To be fair, Daniel Bard was a solid setup man...for about three seasons. But that's the best I've got. 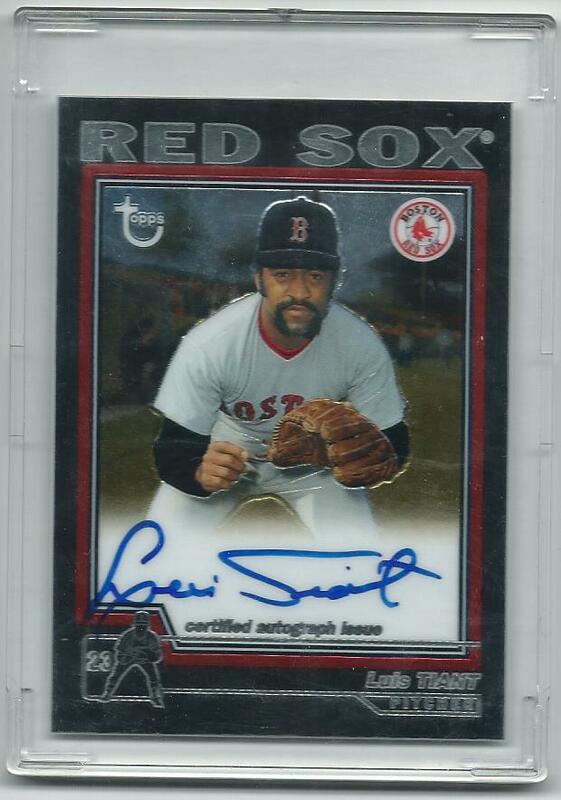 I don't even have an autographed card of a relief pitching prospect. Guess I'll have to hope that The Mick, The Man, and Big Papi can out-slug our opponents. This was fun. I think I might do one for hockey, if that's okay. 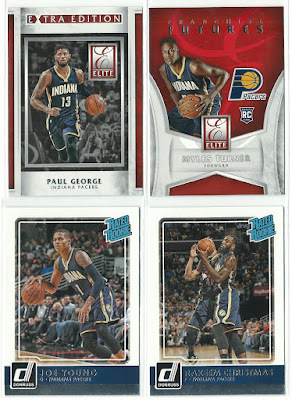 My lineup will be much more balanced. Thanks for reading, and thanks to Zippy for the great BBA idea!